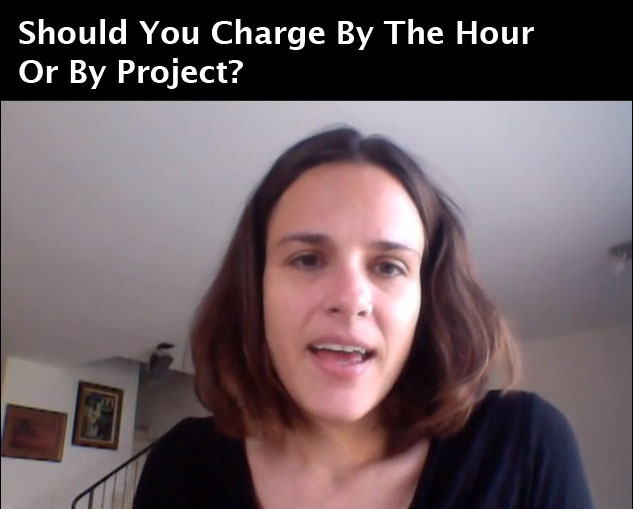 Should You Charge By The Hour Or By Project? At some point all virtual assistants ask themselves, should I charge by the hour or by the project? Now before you go making any changes in the price structure of your virtual assistant business let's hash this out. Here's an example because this will help you understand why it’s important for you to think this through carefully before you go from an hourly to a project rate. Click on the image video to listen to what I have to say about this topic! Charge By The Hour Or By Project? Let’s take graphic designers. Nearly all graphic designers quote project rates and deliver the final product (let’s say this product is a website) at an agreed upon deadline. The client and the website designer sign a contract agreeing on deliverables and a deadline and the project starts. Let’s talk about what happens over the designer's house. Maybe this website is easy peasy and will only take the designer three hours to build out. There is no way the designer is going to tell the client “hey this is going to be an easy site and it’s only going to take me three hours SO instead of charging you my normal fees I’ll knock down the price for you”. No way! That would reduce the designer's profit margin and why would they do that?! Graphic designers have mad skills and they are hired because of their experience and perceived value and probably because they have a boatload of projects in their showcase. But what if the designer is new to graphic design? What if instead of taking 3 hours it takes 2 weeks to build out this website? So the problem is obvious. The designer has got to know without a shadow of a doubt that before he/she can charge a project rate he/shes has to know exactly how much time it's going to take (more or less) to complete the project otherwise it will cost her money (time wasted, money lost). If a client wants you to work on something you've never done before or something that isn't’ in your realm of excellence than you shouldn't offer a project rate. Stick to an hourly rate. But what if you’re charging by the hour and it’s taking you hours to complete a project for a client. The client sees how much time it’s taking you and is angry (within reason). They feel they could have hired someone to do it in less time for less money. The answers? Just don’t get yourself into that situation! If you know that you've never worked on a specific software before and the client is asking you to complete a task let them know that you don’t have expertise in that area but you’re willing to train yourself. See if they will pay you for your learning curve. If it's a software that most VAs use than you should train yourself on your own time. Continue by saying that you will not transfer your learning curve back to the client and will only charge your client for the time you spent on completing the task/project, NOT the time learning it. Your client will appreciate you and in return you’ll get more work in the long run. If however your client is asking you to learn a software that is specific to their business only, they need to pay for your learning curve - nuff said! So, are you charging by the hour or by project or do you do a combination of both and why? Let us know in the comments below because some of the greatest conversations happen there.